I read this article and found it very interesting, thought it might be something for you. 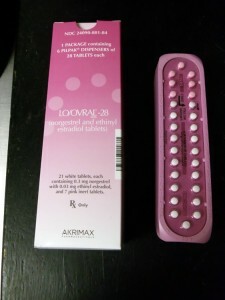 The article is called Birth control pill recall: Lo/Ovral-28 tabs and generics taken off market and is located at http://www.imperfectparent.com/topics/2012/02/01/birth-control-pill-recall-loovral-28-tabs-and-generics-taken-off-market/. LO/Overal-28 has been voluntarily recalled by Pfizer due to a packing error. Photo via Pfizer. One million packs of Lo/Ovral-28 and their generics have been taken off pharmacy shelves today after the company announced that numerous lots had pills which were mixed up within their blister packs and out of order. This could potentially lead to an unwanted pregnancy as hormone pills and non-hormone pills were inter-mixed. It’s possible that women taking these pills could have dosed themselves with up to 7 non-hormone pills in the packages cycle. Three types of blister packs have been voluntarily recalled including Norgestrel and Ethinyl Estradiol, which is the generic version. While the recalled pill is manufactured by Pfizer, it’s distributed by Akrimax Pharmaceuticals with it’s name appearing on the package. Pfizer is asking consumers who may have obtained such faulty lots to download this form, follow the instructions and send the product back postage paid. Pfizer says the packaging error doesn’t put women at any health risk, only the risk of an unplanned pregnancy. For specific lot numbers, visit Pfizer’s website. The Food and Drug Administration has been notified by the manufacturer.